When it comes to wedding fashions, it goes without saying that the women have it a bit better than the men. With tons of bridal dress designs and styles, it can be easy for the bride and bridesmaids to choose wedding attire. 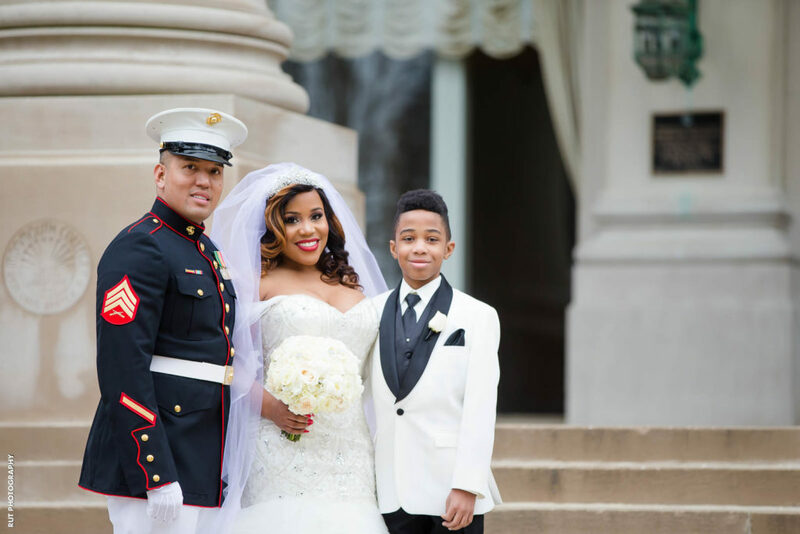 However, most grooms would assume that traditional black suits and ties are their only option. 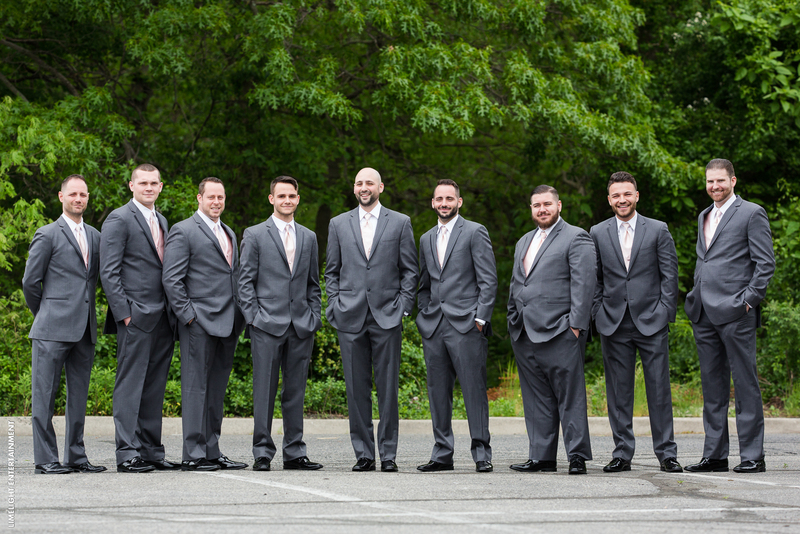 As a popular wedding venue in New Jersey, we at Versailles Ballroom have seen our fair share of dapper groomsmen in the spring. If you’re looking for some stylish options, why not use these photos for inspiration. If you thought that black suits or tuxedos were the only way to go in a spring wedding, think again. As you can see here from these photos of Jackie and Phil’s wedding, the groomsmen took a more laid-back approach to their guys’ fashion. 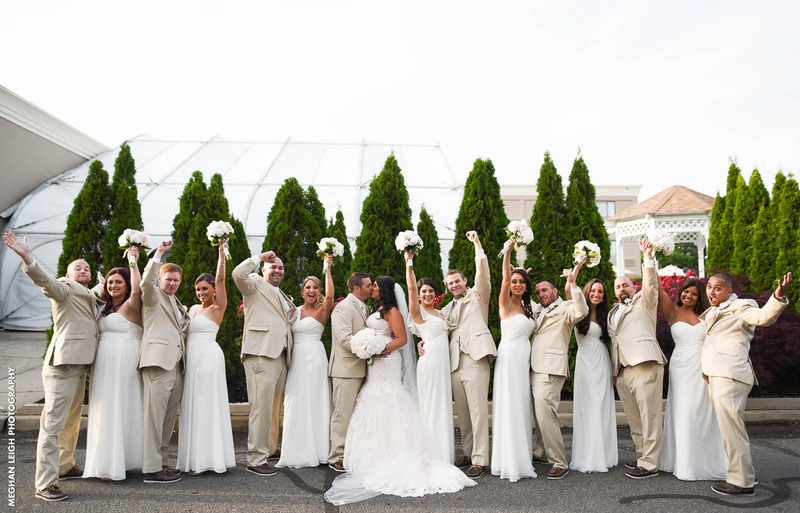 Wearing instead light tan suits with brown loafers and light-colored tops and ties, the groomsmen seem to compliment the flow of the wedding, and the season, very well. As springtime symbolizes light hues and soft colors, going dark isn’t always the best option. 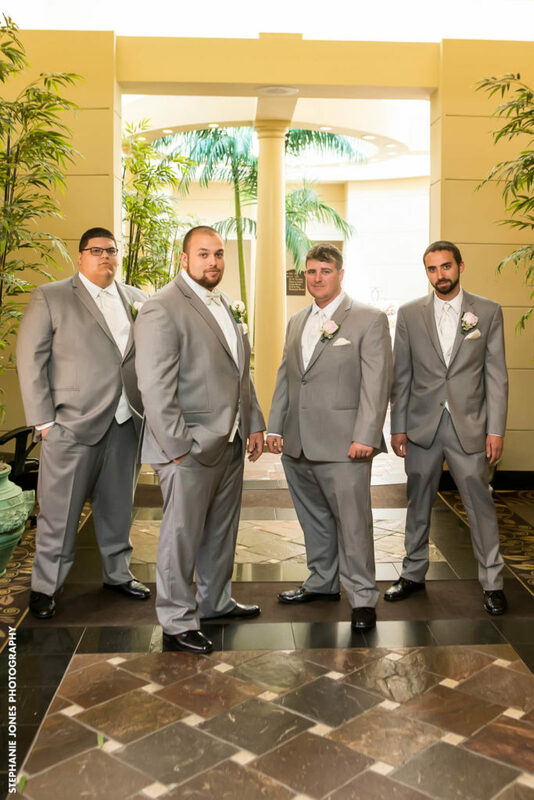 When it came to complimenting this gorgeous wedding, Katelyn and Christopher chose to have their groomsmen dressed in a light grey suit with a white top and tie. Adding just a hint of color in the boutonniere, these suits would compliment just about any color dresses the bridesmaids chose to wear. 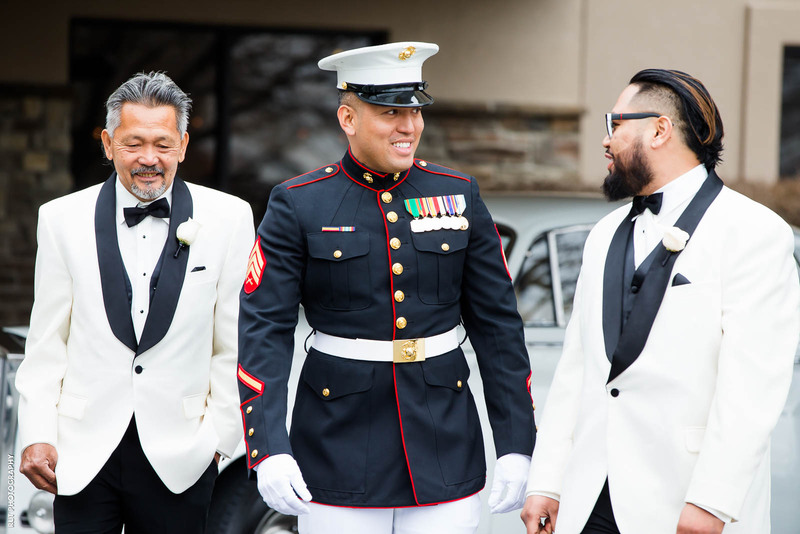 At this military wedding, the Enriquez family chose to switch things up a bit by allowing the groomsmen to wear white suits with black lapels and ties. Though the groom chose to wear his uniform on his wedding day, the groomsmen looked especially dapper standing by his side. 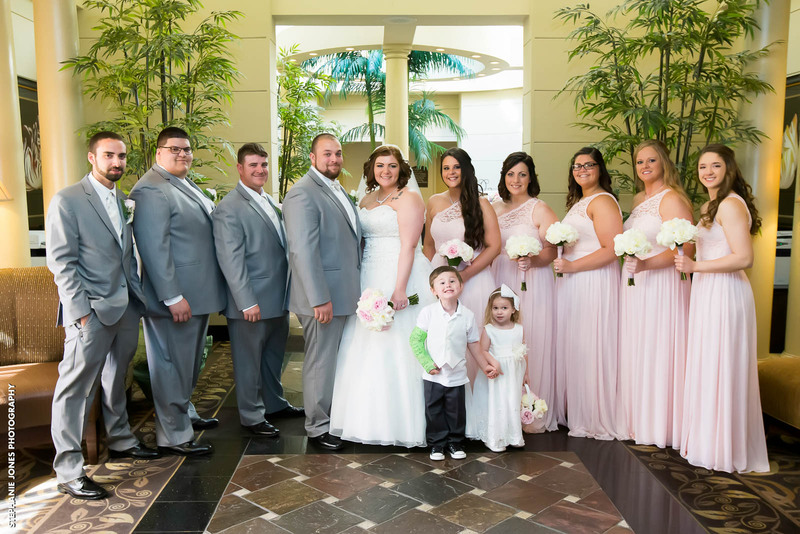 As grey has become an increasingly popular color choice for groomsmen fashion in the spring and summer, Leia and Taylor stuck with the trend and added a bit of spring to the accessories. As the bridesmaids wore a soft pink, the groomsmen tied it in by having soft pink ties, handkerchiefs, and boutonnieres. Though there certainly isn’t anything wrong with wearing a black suit or tuxedo, sometimes the grooms want to stand out as well. As more and more colors become popular for grooms to wear during their wedding day, you’ll find that there are a ton of options that look great for the season and also compliment the color choices very well. As you can see from the couples who have been married at Versailles Ballroom in New Jersey, stepping outside of the box actually looks great on camera.